Internet video broadcasters have shown enthusiasm for reaching the living room TV on platforms other than the living room PC. Active-TV Technology have helped companies like Veoh reach a living room audience. As internet video providers are under pressure to make money from more than just PC access, we have demonstrated an ability to help them reach a TV or mobile audience. 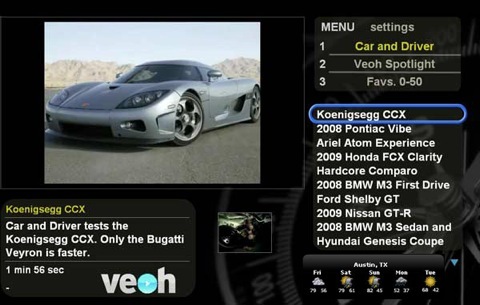 The above TV screen shot, also demonstrates support for TV widgets. The Asutin weather report is a screen widgets supported by YourMinis Widget service. The TV user is required to enter the address ZIP code.